OK, so everyone else called it The Wind Tunnel. But, this is such a friendly and supportive group that, for us, I think it deserves to be called The Wind Tunnel of Love. We were all up early, had a light breakfast, packed the canoes and were on the water shortly after 7:30 am. Our objective was to beat the really strong winds that come up the river in the afternoon. We did get there early–before 11 a.m.–but it was still very windy. Those who have been on this trip before said they have seen it worse than we had it. Although the tunnel stretch of river was only about one half mile long, it took about 15 minutes of paddling. Given our hard paddling and my consciously rhythmic breathing to pace myself through the windiest part, I can now say I’ve done aerobic canoing. But, it was worth it. We set up camp at our final location, some people on the sandy bench above the river, some people tucked into the forest, up a creek canyon. 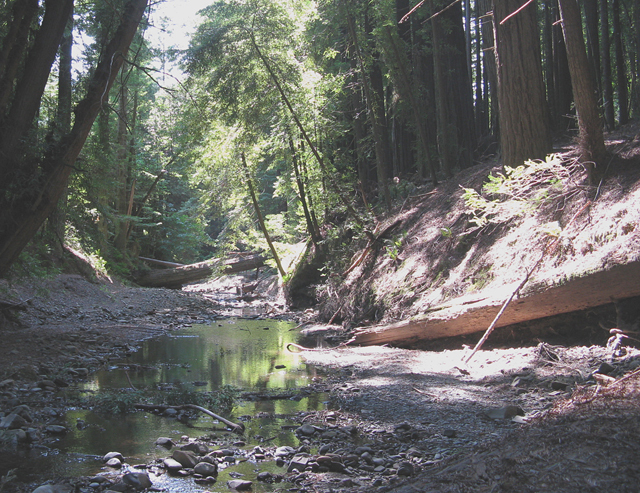 The central commissary area was just below a scenic old railroad trestle, and going under the trestle led to a beautiful little stream in the redwood forest (see picture). We arrived in time for a leisurely lunch during which we could catch our breaths after the workout getting there. Some of us set off that afternoon to pick up cars from the put-in, so we could all have a leisurely morning on our last day.